Chevy Volt and Nissan Leaf sales improve, but the bigger picture suggests sluggish consumer demand for electric cars. NEW YORK ( TheStreet) -- The latest sales figures from the electric car market suggest that the outlook remains mixed for companies whose success hinges on broader adoption of models like the Chevy Volt and Nissan Leaf. The Volt isn't a make-or-break issue for GM ( GM - Get Report) -- in fact, GM's overall auto sales surprised to the upside in February. For lithium ion battery companies, such as A123 Systems ( AONE -- hoping to cash in on future GM electric car models -- and related battery technology, such as lithium ion separator company Polypore ( PPO, broader adoption of electric cars is the core growth narrative. Volt sales rebound, but consumer demand for electric cars still seems tepid. In February, GM sold 1,023 Chevy Volts and Nissan sold 478 Leafs in North America, compared with sales of 603 Volts and 676 Leafs in January. Year over year, the numbers for both electric cars look good, up from 281 Volts and 67 Leafs in February 2011. The pickup month over month in Volt sales from 603 in January to 1,203 also suggests that the Volt is rebounding from the battery fire issue with which 2012 began. Volt sales are still well below the December 2011 record level, though, and Nissan Leaf sales continue to trend down in the North America, on a decline for over six months, and February being the worst sales month for the Leaf since last April. Polypore has become a battleground stock linked to the bullish and bearish divide on electric car adoption versus hype. A123 has recently been focusing on sales of lithium ion batteries to the energy storage market as part of making the case that it's not beholden to consumer demand for electric cars. Stifel Nicolaus said on Thursday that if production and demand do not come into better balance, companies reliant on increased adoption of electric cars like Polypore may be pressured by investors. Cumulative sales of the Volt have been 1,626 vehicles this year, implying total sales of 9,756 Volts in 2012, a 27% year-over-year increase. If this sales data is to representative of 2012 demand, it would be a disappointment from GM, LG Chem which makes the Volt battery and Polypore, Stifel wrote. "Momentum needs to continue to build moving forward to drive meaningful production increases y/y for the Chevy Volt," Stifel wrote. 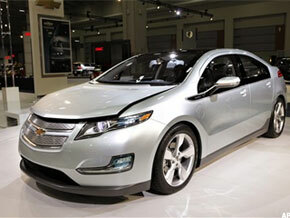 3,876 Volts were produced in February, which if annualized would imply total Volt production in 2012 of 42,636 vehicles. This is significant growth compared with 2011, but still below GM's production target of 60,000 vehicles in 2012. "Either monthly production will need to continue to ramp in 2012 or this production target will not be met," Stifel wrote. In addition, there is the risk of another reduction in production schedules later in 2012 if sales do not begin to catch up with production. For Polypore specifically, Stifel says that the February ramp in Volt production could be a sign that the pressures that led to its disappointing guidance for the first quarter won't be persistent, especially as it generates sales from a more diverse set of customers. Gordon Johnson, analyst at Axiom Capital, who initiated coverage of Polypore at sell earlier this year, took a more negative view of the Volt sales/production imbalance, writing that even amid rebounding sales the Volt story is defined by excess inventory: "With sales significantly underperforming production (GM overproduced demand in Feb. 2012 by 129%), and excess inventory already in the channel, at some point this year GM will have to lower its production targets for Chevy Volts." "We believe that an acute revision lower to GM's production schedule lies ahead (again, this dynamic is what ultimately caused PPO to guide C1Q12 materially lower vs. Consensus as the battery maker that sells into Volt cars i.e., LG Chem is being forced to lower its production ests. which PPO has built capacity to meet," Johnson explained in a research note. A123 Systems, which has a tentative deal with GM for a future electric car model, announced a deal on Thursday with India's Tata for electric bus batteries. A123 shares were up close to 6% on Thursday, though this comes after a very volatile period of trading for the sentiment-driven stock. A123 shares were down by 80% in 2011, have rallied this year by 18%, but in the last week came under heavy selling pressure again, down double-digits before Thursday's Tata deal. The Tata deal is a good headline for a company that remains tied most closely to one of the laggards in the electric car space, Fisker. The Tata deal represents a revenue stream distinct from the Fisker story and in an important market, India. It's a small revenue stream, though, and in an area of electric transportation where A123 has already been an early leader. It's not a game-changer for A123, which remains much more closely linked to Fisker's fortunes. A123 Systems has yet to announce a date to report its fourth-quarter results, and its recent earnings have been highlighted by missed targets related to Fisker delays. One more up day on Thursday for A123 shares could be quickly erased by one more negative guidance revision. Fisker announced this week that it has hired former Chrysler president Tom LaSorda as its CEO, in a management shakeup that saw company founder Henrik Fisker give up the CEO title. The move was a sign of how severe the issues are at Fisker and with its $100,000 Karma model for which A123 is providing the battery. The Department of Energy recently denied a loan to continue the build out of a Fisker plant in Delaware, and the Karma has consistently missed early production targets. LaSorda has been brought in to help find financing avenues after the DOE spurned the company. However, it's worth noting that embattled Fisker has brought in an auto official who knows a thing or two about bankruptcy.